Les Costes 2013: 00% Arbequina Cold Extraction from our state of Les Costes. VEÀ Early Harvest: 100% Arbequina Cold Extraction. VEÀ Extra Virgin: 100% Arbequina Cold Extraction. L’Estornell Organic: 100% Organic Arbequina Cold Extraction. 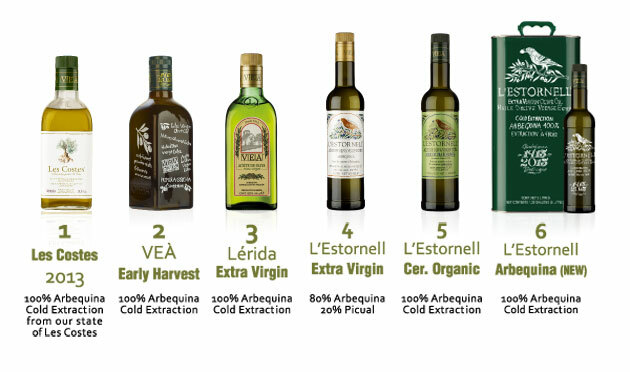 L’Estornell arbequina (Nem): 100% Arbequina Cold Extraction. Les Costes 2012: Del 6, 7 and 8 of November. VEÀ Early Harvest: From November 2nd to the 7th. VEÀ Extra Virgin: From November 7th to the 20th. L’Estornell Extra Virgin or Restaurant: From November the 29th to the end of the harvest. L’Estornell organic: From November the 2nd to the end of the harvest. L’Estornell arbequina (New): rom November 7th to the 20th. We are in a very dry region, so we depend a lot of the rains. We had a big amount of rains during the first half of the year 2013, so we were expecting a good harvest in terms of quantity and also because some trees had no production the last harvest. However we have not had much rain during the second part of the year, so the harvest in terms of quantity is not what we were expecting, but it is good. The beginning of the harvest was by the beginning of November and the maturation of the olives was a bit advanced because during the last period before the harvest, we had no rains. Our olives always have a very good maturation because we deal with traditional agriculture. The quality of the oil is much better than last harvest, because last harvest the olives where very small, so you could find a bit of woody taste on the oil. This year the oils is very well balances because the volume of the stone in comparison with the olive was the right one. This year in general there is a problem with the fly in most of the regions and this affects to the quality of the oil; acidity, peroxides…. However we have not had this problem because we have an extreme weather. So one more time thanks to our climate. Very smart in your mouth, not very aggressive. Very long finish with a taste of dry fruits (almond). The color is a bit greener than usual.